Students with disabilities are a rapidly growing, yet historically underrepresented population in postsecondary education. Historically underrepresented groups share a common experience: all faced unwelcoming environments when initially entering higher education (Hall & Belch, 2000). 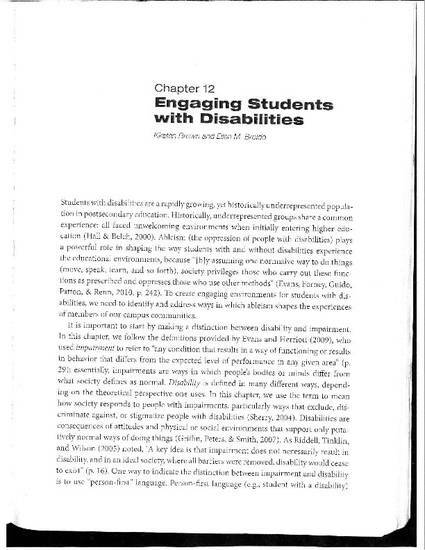 Ableism (the oppression of people with disabilities) plays a powerful role in shaping the way student with and without disabilities experience the educational environments, because “[b]y assuming one normative way to do things (move, speak, learn, and so forth), society privileges those who carry out these functions as prescribed and oppresses those who use other methods” (Evans, Forney, Guido, Patton & Renn, 2010, p. 242). To create engaging environments for students with disabilities, we need to identify and address ways in which ableism shapes the experiences of members of our campus communities.